500 Words From...is a series of guest posts from Asia-based authors published by Asia-based, or Asia-focussed, publishing houses, in which they talk about their latest books. Here Kolkata-native Kalyan Lahiri, talks about his debut novel, The Kolkata Conundrum, which introduces detective Orko Deb. It is published by Hong Kong-based Crime WavePress. 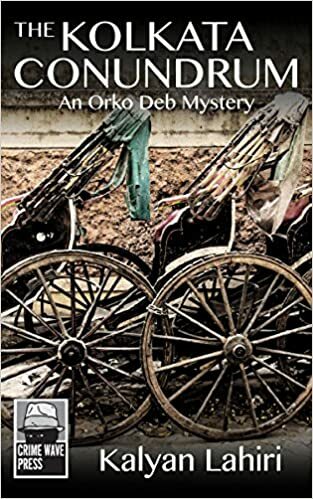 On my sixtieth birthday, I could add the words published author to my CV, thanks to Crime Wave Press publishing The Kolkata Conundrum a few days before my birthday. I have to confess that prior to this I had never had any work of fiction, in any form, published anywhere. I had not even tried. But I had for long, at the back of my mind, a wish to create a detective character. For me, the character of the detective, the other characters around him, the setting of the story – these were more important than the actual plot. Thus, after quite a bit of soul-searching, agonising, setting this against that, and so on, was born Orko Deb. He is very young, barely out of college, in his early twenties and ready to begin the journey of life. Life’s realness and earnestness have not yet hit him; he is ready to drink it to the lees and, like a medieval knight, go out into the world seeking adventure. He has some semblance of a support system and it grows as the story progresses. The setting had to be Kolkata, my home town, and its immediate environs. A bit of rural Bengal too has crept in. To my mind, the setting for a detective novel has a role to play in both chronicling and commenting on the socio-economic background to the story. Of course, one has to avoid any direct comment; it has to be show and not tell. Getting the plot right was the hardest part of the process. There had to be a murder, to be sure. Then there had to be at least another crime and the two had to be connected. For every twist in the story, at least three more were thought of and discarded. The other characters grew as the plot grew and in fact took on a life of their own. There were so many changes, mid-course corrections, alterations, additions and so on, that at one point even I was getting confused. And I seemed to have made my task harder by not having a narrator, like Holmes’ Watson or Poirot’s Hastings. It occurred to me that a narrator would make it easier to obscure clues from the reader or create red herrings. The idea was toyed with, but in the end I did it my way. I had originally named the novel The Golden Red Security Agency, but Tom Vater of Crime Wave Press insisted, and rightly, that the name be changed. Tom finally selected The Kolkata Conundrum – a far better title. And now I am working on the next Orko Deb mystery. The bug seems to have bit me! Details: The Kolkata Conundrum is available as an eBook, from the US Amazon site, priced at USD 6.99.